Wet Brain or Wernicke-Korsakoff Syndrome: What are the Symptoms? You have seen him on the street. Walking unsteadily. Slurred speech. Eyeballs moving unnaturally as if he has no control over them. Violent muscle twitches. Mental confusion. Mumbling about events that are evidently figments of his imagination. This is not a person who has had one drink too many the night before. You are seeing an alcoholic who is probably suffering from wet brain syndrome. He presents a sorry sight, but the reality is grimmer. If his wet brain disease is not treated, he will die. What is Wet Brain Disease? Wet brain, also known as Wernicke-Korsakoff syndrome, is the result brain damage due to severe thiamine or vitamin B1 deficiency. This condition usually progresses in two stages if left untreated – the first stage is Wernicke encephalopathy, and the second stage is Korsakoff syndrome, AKA Korsakoff psychosis. According to the National Institutes of Health, wet brain disease is a type of brain damage caused by severe deficiency of thiamine or vitamin B1. It is also known as Wernicke-Korsakoff syndrome, named after Dr. Wernicke and Dr. Korsakoff who identified the symptoms of the disease. The first stage of wet brain disease, Wernicke encephalopathy, is acute and damages the lower parts of the brain including the thalamus and hypothalamus. This damage is reversible if the patient receives prompt treatment. The second stage of the disease, Korsakoff psychosis, is a chronic state of permanent brain damage which affects memory. The symptoms of this stage are triggered if Wernicke encephalopathy is not treated in a timely manner or is left untreated. What Causes Wet Brain Syndrome? Though thiamine deficiency alcoholism is more common, other non-alcoholic conditions can cause this vitamin deficiency. Amongst non-alcoholics, thiamine deficiency can be caused by poor diets that lack this basic nutrient, a rare disease called genetic beriberi that impairs the body’s ability to absorb thiamine from food, anorexia nervosa, and bulimia. Sometimes pregnant women who have prolonged periods of morning sickness develop thiamine deficiency. Thiamine deficiency can occur in persons who are unable to absorb sufficient nutrients from food. For instance, individuals suffering from chronic illnesses like cancer or AIDS or those who have undergone bariatric (gastric bypass) surgery often cannot absorb food leading to nutritional deficiency. Some therapies, when administered for prolonged periods, can cause thiamine deficiency. Long-term diuretic therapy for heart failure and dialysis cause the body to lose this vital vitamin. Why is Thiamine Deficiency Alcoholism Common? There are several reasons why alcoholic wet brain disease is common. Historically, thiamine deficiency is associated with alcoholism. According to a publication by the U.S. Department of Health and Human Services, alcoholism impairs the body’s ability to absorb thiamine from food sources. Those who drink heavily should make an effort to eat foods rich in thiamine or to take vitamin supplements to help prevent thiamine deficiency. Thiamine deficiency alcoholism is also common because many alcoholics neglect to eat nutrient-rich diets, either because they are too intoxicated or lack the motivation. So they are generally nutritionally deficient. Though thiamine deficiency can occur in non-alcoholics, the risk of developing wet brain disease is higher in alcoholics. This is due to the peculiar way in which sugar acts on the thiamine-deficient brain. According to this research, prolonged glucose intake by someone who has thiamine deficiency increases his risk of developing Wernicke-Korsakoff syndrome. Sugar or glucose is a by-product of alcohol metabolism in the brain. What are the Classic Wet Brain Symptoms? Countless research studies, like this one, have established the importance of thiamine in maintaining brain functionality. Thiamine also facilitates conduction of signals between nerves and maintains normal muscle contraction. Thiamine deficiency alcoholism affects the brain and the nervous system and triggers a cascade of symptoms. Droopy Eyelid is one of the symptoms of alcoholic wet brain syndrome. loss of mental abilities that may be fatal. Dr. Wernicke discovered that alcoholism causes thiamine deficiency that, in turn, adversely affects the nervous system, brain, muscles, heart, and the gastrointestinal system. If Wernicke encephalopathy is not treated promptly, Korsakoff psychosis develops and damages structures of the brain associated with global amnesia, which is the inability to remember new information. The classic symptoms of Korsakoff psychosis are severe loss of memory and inability to process new memories. Other notable symptoms are hallucinating and making up stories and believing in them. Dr. Korsakoff identified these symptoms while exploring memory disturbance and loss in alcoholics. Unfortunately, it takes days and weeks for results of thiamine deficiency tests to be processed. Sometimes, the symptoms of thiamine deficiency may not even manifest for days and weeks. 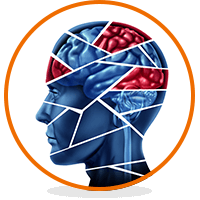 It is imperative that physicians are not only familiar with the signs and symptoms of alcoholic wet brain disease but also able to extract the best clinical history from patients and/or their loved ones to make an accurate diagnosis. Family members of alcoholics should also be on the lookout for symptoms and be aware of the food habits of their loved ones. Fortunately, there is a treatment for wet brain as long as it is diagnosed in the early stages. Prompt intravenous administration of 500 mg of thiamine hydrochloride in normal saline solution should be given to patients with acute Wernicke encephalopathy three times a day for at least three days. The gold standard of treating Wernicke encephalopathy is prompt and sufficient thiamine replacement. The thiamine should be administered intravenously because the human body can use only 5 percent of the thiamine taken orally whereas IV thiamine has 100 percent bioavailability. According to the findings of this research study, 500 mg thiamine hydrochloride with normal saline should be given to patients with acute Wernicke encephalopathy thrice daily for at least three days. This is to be followed by 250 mg of thiamine hydrochloride in regular saline once daily for three more days. IV therapy should be followed by an oral thiamine course. Comatose, lethargic, or unconscious patients should be treated at a medical facility where their vitals can be monitored constantly. But sometimes treating thiamine deficiency poses significant challenges. For instance, patients who have developed thiamine deficiency due to malnutrition or vomiting for prolonged periods may also have low blood sugar levels. Hypoglycemia or low blood sugar necessitates the administration of glucose. But administering glucose to thiamine-deficient individuals can increase their risks of developing Wernicke encephalopathy. According to this research, hypoglycemic patients should be administered glucose urgently to prevent them from going into a coma. But thiamine MUST be administered to them as soon as their blood sugar levels normalize. What is the Wet Brain Prognosis? Wet brain syndrome MUST be treated urgently, else the symptoms cannot be reversed and worse, the individual usually dies. Fortunately, most symptoms of Wernicke encephalopathy, like vision and speech problems, uncontrolled muscle movements, unsteady gait, and confusion or delirium, can be slowed, stopped, or reversed if treated promptly with thiamine supplementation. Here is a case study that demonstrates how intensive thiamine replacement therapy can manage and improve the symptoms of Wernicke encephalopathy and help an individual regain most of his physical and cognitive functionalities. Untreated alcoholic wet brain disease can trigger complications like permanent alcoholic neuropathy that causes a host of symptoms like problems in swallowing and talking, uncoordinated muscle movements, impotence, nausea and vomiting, urine incontinence, and constipation or diarrhea. Untreated Wernicke encephalopathy progresses to Korsakoff psychosis. Unfortunately, wet brain prognosis is grim for individuals who have developed Korsakoff psychosis. Symptoms like memory loss and loss of mental abilities are usually permanent. Wet brain death is not uncommon. The severe brain damage that has developed into Korsakoff psychosis leads to cognitive decline and dementia in thiamine deficiency alcoholism. The final stages of wet brain are coma and ultimately premature death. At all stages, wet brain disease should ideally be treated at a medical facility where doctors can monitor symptoms and administer drugs accordingly. The cost of treatment depends on the length of stay in the hospital, which, in turn, depends on the severity of symptoms. Sometimes patients with thiamine deficiency alcoholism and/or mild symptoms of Wernicke encephalopathy are discharged within a week after they have been administered IV thiamine. Patients who have developed Korsakoff psychosis require longer stays and extensive physical and cognitive rehabilitation to improve symptoms like uncoordinated muscle movement and mental confusion. The duration of the hospital stay also increases if patients have complications like malnutrition, liver damage, and cardiovascular disease. After being treated for thiamine deficiency, some patients are discharged to be cared for in a nursing home. These are patients who may need help eating, walking, or bathing. At other times, patients who exhibit psychiatric disorders like alcoholic wet brain-related dementia are admitted to a specialty psychiatric treatment unit. This study presents the cases of two individuals diagnosed with wet brain disease to help you understand how different symptoms and their severity determine the approach and duration of treatment. Why is thiamine deficiency common in alcoholics? Thiamine deficiency is common to alcoholics because they usually choose to drink rather than eating nutritious foods. Even when alcoholics don’t avoid eating, consuming large amounts of alcohol regularly can cause the body to have difficulty absorbing thiamine. The treatment for Wernicke-Korsakoff syndrome to improve wet brain prognosis can be lengthy and costly because thiamine deficiency alcoholism manifests as a clutch of co-occurring symptoms. Therefore, it is imperative that physicians along with those who drink heavily and their loved ones learn to identify the signs of wet brain syndrome and seek treatment immediately. People who drink alcohol regularly should make sure that they take regular thiamine supplements. The best way to prevent wet brain syndrome is to abstain from alcohol and maintain a balanced diet. A person who continues to drink should keep in mind that alcoholic wet brain can lead to permanent brain damage, coma and death. I have been sober for six months and am still having walking difficulties. The only treatment I have received is from oral medication. Would it be too late to try the Thiamine IV therapy? Doctors in my location do not seem to take this very seriously and it doesn’t seem to be the protocol for treating my deficiency. I am praying that you can get the help you need and will continue to stay sober. I am living this nightmare right now with my son who has all the classic signs of this terrible disease.